This delightful riverside scene was taken from Jubilee Bridge and looking south. The building on the far right, at the end of North Parade and where for many years the Barnes family had a drapers shop, dates from 1861. Just above can be seen the Temple Hotel. One row back from the river, slightly to the right of the centre of the picture, is South Parade and the row of two and three storey houses visible above the Parade are on Temple Walk. The buildings that are so beautifully reflected in the waters of the River Derwent have long gone; they were demolished for road widening as the A6 trunk road, which passes through the village, was particularly narrow at that point. Several of these riverbank properties had balconies overhanging the water, somewhat reminiscent of Venice. The furthest away of the row, in the centre of the picture, was the Devonshire Hotel which used to be almost opposite Hodgkinson's Hotel. The Devonshire Arms, as it was then known, was first listed in a Trade's Directory in 1831 and was run by Thomas Smedley; by the time of the 1841 census his wife Jane was there on her own. Jane then married the widowed William Ellis who was followed as proprietor by his son George and remained there until he died on 20 Aug 1866. The name changed around 1862 and the building became the Devonshire Hotel. The Radfirth family were there for some years and Joseph advertised in Bemrose's Guide. They were followed by Samuel Robinson (1837-1918), who married Joseph Radfirth's widow, and had for a time had worked as a butler to Charles Clarke at Masson House. He was listed in directories between 1876 and 1899 but had retired by 1901 when Frances Lake was the proprietress. William T Hill had taken over by 1908 and Alice Ann Hill was in charge in 1912. William Freckleton had succeeded her by 1916. Albert Edward Potter seems to have been the last proprietor of the hotel listed to be in a directory (Kelly's Directory, 1928). In early 1931 the Devonshire Hotel, then tenanted by George Arthur Hutchinson, had its licence revoked by the Matlock Brewster sessions and the bench referred the Devonshire Hotel's licence to the compensation authority. Things then became rather complicated as no agreement was accepted although £1,498 was the sum suggested by the compensation authority and the matter was then referred to the Inland Revenue Commissioners. Later in the year Offiler's Brewery of Derby sued Mr. Hutchinson for "rent and Mesne profits" which Hutchinson counter claimed; his solicitor described the agreement that existed between him and Offiler's as "the most oppressive and inequitable agreement I have ever seen". Agreement was finally reached in November. From then on the Devonshire Hotel was known as the Devonshire Café and was the home of Charles and Mary D Parker. See Hadfield Cubley's card of this scene. It is in the "Just images" section of the site. Use the MI Surnames Index to locate the memorials for several of the families named above. 1. 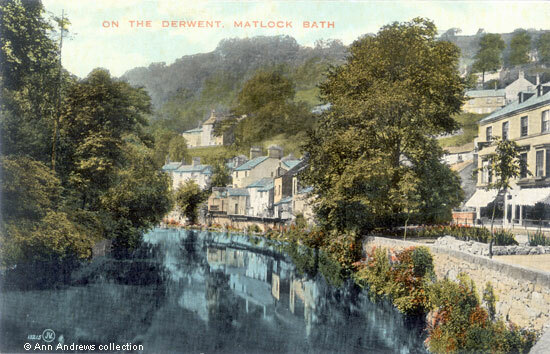 "On the Derwent, Matlock Bath". Postcard from Valentine's "Colourtone" Series - number 13215. Not posted but the image was registered in 1890. My card has a divided back so I have assumed in was printed between 1900 and 1905. 2. "Parade and River Derwent". Photograph, Valentine's No.13215. 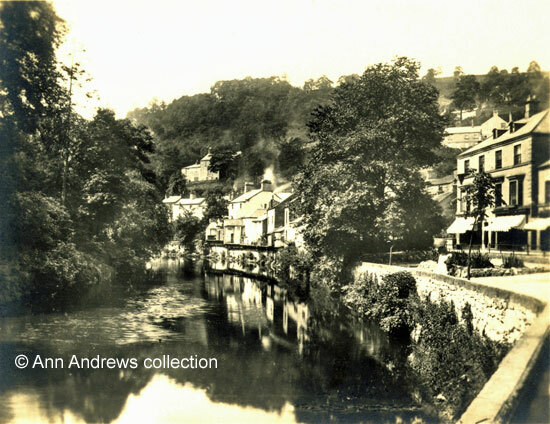 One of a series of Valentines snapshots - photographs of Matlock Bath - originally in a card folder. Jane Smedley (1784-1871, m. William Ellis 1843, bu Matlock). She died at Matlock Bath on 20 March 1871, aged 87 ("Derbyshire Advertiser and Journal", 31 March 1871). William Ellis (joiner, had m. 1st Sarah Bland in 1815, bu Matlock 1859). Ann, the widow of George Ellis, married Joseph Radfirth at St. Giles' Church in 1867 ("Derbyshire Advertiser and Journal", 6 September 1867). Joseph was the son of Geoge Radfirth of Matlock Bath. "Bemroses' Guide to Matlock, Bakewell, Chatsworth, Haddon Hall, &c" (1869) by John Hicklin, Third Edition, pub Bemrose and Sons, London. See Joseph Radfirth's advert. Joseph Radfirth's widow married Samuel Robinson, second son of William Robinson of Markfield, at St. Giles' on 16 Feb 1871 ("Derbyshire Times", 25 February 1871). The Historical Records have census and trades directory transcripts for Matlock and Matlock Bath. Of the directories mentioned above only 1928 has not been transcribed. Also see Wills, Surnames R for Samuel Robinson. When Miss Lake, later Mrs. Frances Sarah Dale, died in 1934 the Devonshire Hotel was described as one of the of the oldest hostelries in Derbyshire. She was then aged 77 and lived at "Woodhey," Henry Avenue, Matlock ("Derby Daily Telegraph", 12 March 1934). Kelly's 1916 Directory. William Freckleton died at Whitworth on 25 July 1942 ("Derbyshire Times", 31 July 1942). His obituary stated that he had kept the Devonshire Hotel for 12 years. "Derby Daily Telegraph", 11 March 1931. Hotel licenses at Matlock Bath (the Matlock adjourned Brewster Sessions). "Derby Daily Telegraph", 29 March 1932. "Derby Daily Telegraph", 13 September 1932. "Derby Daily Telegraph", 1 November 1932. Announcement at Leicester County Court.